If you want to completely enjoy your outdoor space and use it to the max, you should show it some love from time to time by uplifting and changing up its design. Following the most current trends is always the best way to go when you feel tired of your old design, so here are some of the most recent sweethearts in the world of landscaping that might inspire you to breathe new life into your old yard. Pay attention. There’s no rule that states that your outdoor area can’t be as comfortable as your indoors. Therefore, replace your current outdoor furniture with a more comfortable alternative, and create that cosy indoor vibe by arranging it around an outdoor fireplace or a fire pit. Either one of these features – a fireplace or a fire pit – will work as an element that will bring a warm ambiance, both figuratively and literally, to your outdoor seating area. Of course, don’t forget comfortable seating and throw pillows, as well as soft blankets you can use for some additional warmth. The trend of bringing the indoors out continues further. Outdoor kitchens, barbecue and dining areas have become a staple element of any contemporary yard. You can also decide to take things even further and create an outdoor bar, a lounging area, as well as the area reserved for some good old movie entertainment. Basically, your imagination is your only limit. 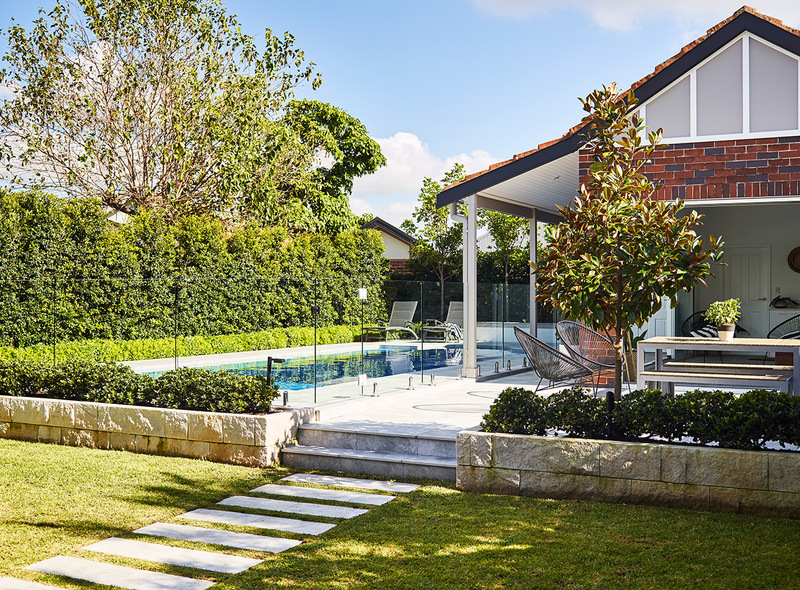 Whether you opt for installing a pool or you decide to create an outdoor spa area is up to you. The important thing to keep in mind is that no contemporary outdoor space should be left without a bathing area. The hidden idea behind contemporary landscaping trends is bringing the comfort of every indoor room outside, and of course, the room reserved for self-indulgence and relaxation is no different. So, inspect the amount of room you have in your yard and choose one of these two features that will instantly elevate the look of your outdoor space and make it more private. Since eco-friendly living is currently the hottest trend you can follow, try to be as green-conscious as possible when choosing the plants for your outdoor area. Native plants are always the best way to go because not only do they require less maintenance, but they also provide a shelter for the local wildlife. Additionally, consider implementing a potager and herb garden into your design as well, as these will not only boost the eco-friendliness of your outdoor space, but they will also help you embrace healthy eating. As most of these activities do require a certain level of expertise, it would be best to contact experienced professionals, such as the people behind Think Outside Gardens, to help you out. There is not a lot of point in rocking a beautiful landscape in your outdoor area if the design is barely visible once the night falls. Therefore, make sure you layer the outdoor lighting solutions just like you would in your indoor area, to further enhance and accentuate all of the beautiful elements of your contemporary backyard. Of course, solar lights are the best way to go because not only are they not wasting any resources, but the light they give off is subtle which makes it perfect for spending some quality time relaxing outside. As you can see, a truly contemporary landscape design aims at bringing all the comfort of your indoor space outdoors, making the time you choose to spend in nature that more pleasant and enjoyable.